While in school working toward my art degree I just didn’t seem to quite fit in with either my teachers or my fellow students. As a business-student transfer I was just a little too uptight and logical. And as a minimalist it was really hard for me to throw everything into my artwork. My natural tendency is to do the least necessary to share my message. 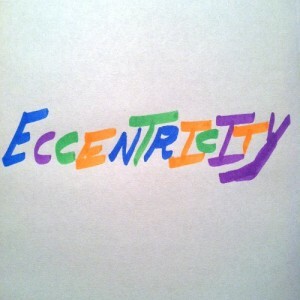 Even a couple of family members said that I wouldn’t make a good artist, I’m not eccentric enough. And upon first glance I can see where that might appear to be the case. You’d never pick me out as an artist by the clothes that I wear, the way that I talk, or by any of the other stereotypes that artists seem to perpetuate. I’m just not that flamboyant. Don’t get me wrong, I’m still eccentric (but who isn’t?) I mean, I don’t care about listening to music. My eccentricity is just more subtle, you almost have to be looking for it to recognize that it’s there. My focus is the art. I’m an extroverted introvert – I enjoy the company of others and need it but then I need alone time to recharge. So while I love to meet people and make new friends my life is designed to facilitate making art. This means that I spend a lot of my time reading, taking notes, doodling, and playing with art materials. Most of my wardrobe matches each other, so I can just grab clothes in the morning and not have to give it much thought. My daily todo list consists of “draw a stick figure” and “write”. Eating the same few meals over and over doesn’t bother me, and leftovers work just dandy. My goal is to make art and just being me helps me make the art that I enjoy making. Not being flamboyantly eccentric isn’t required. Being myself is. Previous Previous post: Why Stick Figures?